Do you have those days when you get home and you just don’t have any voice left? Music classrooms are LOUD—and I’ll be the first to admit that it’s partially due to my loud and excitable personality—but I have often found myself feeling the pain of talking over 22 xylophones when I needed the students to stop for something. 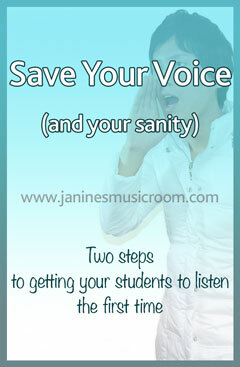 So here are some classroom management ideas to take better care of your voice as well as your mood. First of all, slow down. Easier said than done, as specialists get so little contact time with students, and there is pressure to get through a lot in that limited time. This was much easier for me after I became a mother and learned to speak “motherese”. For me, speaking more slowly keeps me calm, which helps the students to be calm. Second, and closely related to what I learned from speaking motherese, use a relatively quiet voice (probably your normal voice, but not your normal teacher voice), and stop repeating yourself. This takes some adjustment if the students are used to something else. But after a while, they will start to tune in to your voice, knowing that you aren’t going to keep shouting over their noise. The key to this is just sticking to it. Stand somewhere where the students can see you; I promise that if you stand there looking at them, most of them will feel it and look up at you pretty quickly. In your quiet voice, give your first direction. Once. At this point, you will have lost some of the kids already. Here’s the part where you need to stick to it. Stand there and wait for them to follow your direction. Some of them will still be with you—partially because things are different—and they will be the ones who start directing the other children. They will tell their confused peers what to do and encourage them to do it. Okay, honestly, this takes time and patience. If your classroom is anything like mine, it will take a few weeks before it catches on, but once it does, it’s a beautiful thing! My classroom is still a work in progress, but these two adjustments have helped me to go home in a much better mood at the end of the day. What changes have you made in your classroom to work more efficiently?